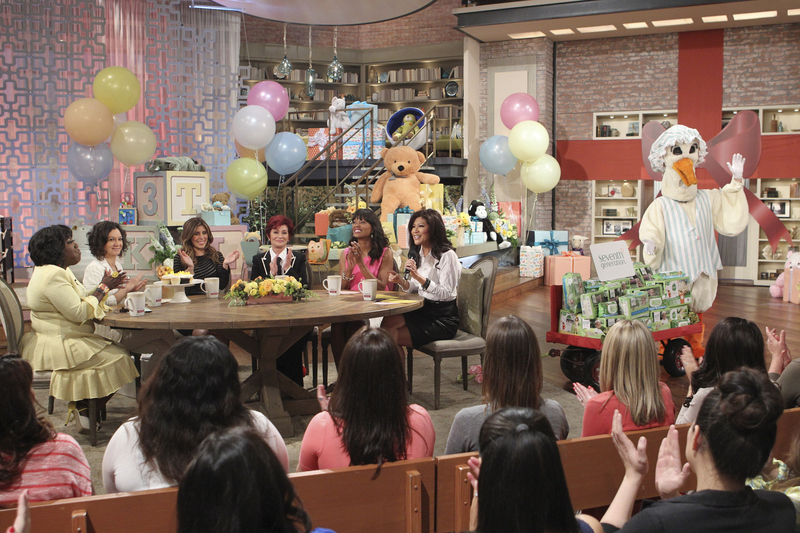 THE TALK hosts their annual “Million Dollar Baby Shower” show filled with giveaways for an audience of first-time expectant mothers. THE TALK co-hosts, Julie Chen, Sara Gilbert, Sharon Osbourne, Aisha Tyler and Sheryl Underwood, welcome special guest, mom-to-be Jamie-Lynn Sigler, to help host the festivities and surprise the audience with an exciting hour of gift-giving to provide them with everything they need to prepare for their new arrivals. The audience was showered with more than $1 million in gifts, Friday, April 26, 2013, on the CBS Television Network. Sheryl Underwood, from left, Sara Gilbert, Jamie-Lynn Sigler, Sharon Osbourne, Aisha Tyler and Julie Chen, shown. Photo: Sonja Flemming/CBS ©2013 CBS Broadcasting, Inc. All Rights Reserved.